Rome—About 300 million children in the world are living in areas with outdoor air so toxic — six or more times higher than international pollution guidelines — that it can cause serious health damage, including harming their brain development. This shocking finding has just been revealed by the United Nations Children’s Fund (UNICEF), in a new report — ‘Clear the air for children.’ “Pollutants don’t only harm children’s developing lungs — they can actually cross the blood-brain barrier and permanently damage their developing brains — and, thus, their futures,” UNICEF’s executive director Anthony Lake on Oct 31 said while announcing the report. These findings come a week ahead of the 22nd Conference of the Parties (COP 22) to the UN Framework Convention on Climate Change (UNFCCC) in Marrakesh, Morocco, where UNICEF is calling on world leaders to take urgent action to cut air pollution in their countries. 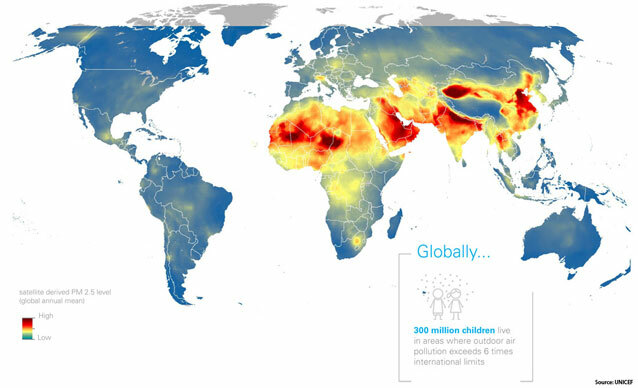 Using satellite imagery, the report further shows that around two billion children live in areas where outdoor air pollution, caused by factors such as vehicle emissions, heavy use of fossil fuels, dust and burning of waste, exceeds minimum air quality guidelines set by the World Health Organization (WHO). South Asia has the largest number of children living in these areas, at 620 million, with Africa following with 520 million children, and the East Asia and Pacific region with 450 million children living in areas that exceed guideline limits. UNICEF further stressed that children are more susceptible than adults to both indoor and outdoor air pollution as their lungs, brains and immune systems are still developing and their respiratory tracks are more permeable. It added that young children also breathe faster than adults, and take in more air relative to their body weight. In particular, the most disadvantaged, who already tend to have poorer health and inadequate access to health services, are the most vulnerable to the illnesses caused by polluted air. The UNICEF report also examines the impact of indoor pollution, commonly caused by the use of fuels like coal and wood for cooking and heating, which mostly affects children in low-income, rural areas. UNICEF further added that it is asking world leaders attending COP 22 to take four urgent steps in their countries to protect children from air pollution, these include: reducing pollution to meet WHO global air quality guidelines; increasing children’s access to health care; minimising children’s exposure to sources of pollution such as by locating sources of pollution such as factories away from schools and playgrounds as well as by use of cleaner cook stoves; and monitoring air pollution. For its part, the United Nations World Health Organization (WHO) in partnership with the Coalition for Climate and Clean Air (CCAC) and the Government of Norway on Oct 20 launched a global awareness campaign on the dangers of air pollution — especially ‘invisible killers’ such as black carbon, ground-level ozone and methane — for the health of individuals and the planet. Titled BreatheLife: Clean air. A healthy future, the campaign aims to mobilise cities and their inhabitants on issues of health and protecting the planet from the effects of air pollution. ‘BreatheLife’ brings together expertise and partners that can tackle both the climate and health impacts of air pollution. According to WHO, air pollution kills nearly seven million people each year, nearly 12 per cent of deaths worldwide. And it is responsible for 35 per cent of deaths due to lung disease, 27 per cent of deaths from heart disease, 34 per cent of deaths from stroke, and 36 per cent of deaths from lung cancer. The campaign seeks to cut in half the number of deaths from air pollution by 2030 — the target year for the achievement of the UN Sustainable Development Goals (SDGs), adopted by the UN General Assembly in September 2015. ‘Breathe Life’ highlights the practical policies that cities can implement to improve the air quality through better housing, transport infrastructure, managements of waste and energy systems. It also educates individuals and communities about the measures they can take daily to achieve cleaner air, such as stopping the incineration of waste, development of green spaces and the choice of walking or cycling. For WHO and its partners, this series of measures to achieve a reduction of pollutants could significantly reduce the number of annual deaths from air pollution. Baher Kamal is director of the Middle East and North Africa agencies at the Inter Press Service. Kamal is an Egyptian born, Spanish national with more than 40 years of professional experience as a journalist — from reporter to special envoy to chief editor of national dailies and an international news agency. Greenhouse gases aren’t the only pollutants we produce which have the potential to disrupt the climate.